The silver relief plaques show the planets, the signs of the Zodiac, the Seasons and the Elements. The figure of Prudence reclines on the lid. The hunting scene shown in front of the casket is from inside its lid. A very similar silver casket by Wallbaum has been in the Munich Schatzkammer since 1635. Casket; ebony; numerous mouldings, pierced bands and cartouches in relief, silver partly gilt; eight panels round sides, four oblong representing the Seasons alternating with four ovals for the Elements; front: Spring between Water and Fire, symbolised by Neptune and Jupiter with thunderbolt; back: Summer between Air and Earth, represented by two female figures; cover: recumbent female figure holding mirror with snake round handle, little boy seated on skull at her feet, right hand held medal of Henri IV and Marie de Medici, now lost; drawer in lower part; inner side of lid fixed with oblong silver panel with scroll border showing combat between two men and a lion, bears etc: this is shown separately as a plaquette in a frame, its original position inside the lid is indicated by holes. This plaquette bears maker's marks and hallmarks.Key; document in French inside. Openwork. This object was previously owned by Odiot Père, collected by Anselm von Rothschild and bequeathed to the British Museum by Ferdinand Anselm Rothschild. Marks: The two punch-marks occur only once - on the frame of the rectangular lion-hunting scene inside the lid of the casket. (i) Assay mark of Augsburg, after 1576 (R3 130(7)), or Seling 31 (1610-15). (ii) The symbol of a tree, within a shield : the punch-mark of Matthäus Wallbaum (R3 428; Seling 1060). Provenance: Baron Anselm von Rothschild, Vienna, before 1866. The casket was stated, in Schestag 1866, to have been made for Henri IV of France but, as no additional evidence was quoted, it reads as if this royal provenance had been deduced from the presence of the gold medallion of Henri IV and Marie de Médicis - at that time (1866) held in the right hand of the emblematic figure of Prudence, on the finial of the hinged lid. However, in the drawer of the casket - but unrecorded in Schestag 1866 - are two manuscript copies of mid-nineteenth-century documents, both written in French: firstly, a short note signed ‘Odiot Pere’ and dated 8 December 1847, asking Monsieur Louis Mellor to accept this casket “qui a appartenu au Bon Henry IV”, and, secondly, a long account of the writing casket, beginning “L’encrier d’Henry IV . . .”. Both of these documents, which are quoted in extenso below, clearly refer to the same object -the one that entered Baron Anselm's collection in Vienna before 1866. Indeed, they led to its provenance being published in Read 1902, as follows: “From the collection of Odiot Pere, 1847, who believed it to have been the property of King Henri IV, and from the hand of Jean Goujon”. Je prie mon bon et veritable ami Monsieur Louis Mellor d'accepter en souvenir de la sincere affection que je lui porte ce petit coffret qui a appartenu au bon Henry IV, et que je lui offre de bon Coeur. “L'Encrier d'Henry IV, sous l'image de la Verité, a toujours été apprécié, autant en chef d'oeuvre d'art qu'en souvenir historique. Le Coffret d'Ébene a 30 centimetres de long, sur 15 de large et 20 de hauteur: il ofFre 7 divisions superposées et 9 corniches: au bas un tiroir pour la plume; en haut un petit reduit à coulisse pour cacher la clef. Ce délicieux petit Meuble, vraiment Royal, est tout couvert de Sujets mythologiques et du zodiaque, d'attacher incrustations d'un fini exquis et de la plus grande délicatesse de ciselure. Travail au repoussé. 104 - Griffons, palmettes et galeries d'argent Massif. 118- Médaillons, Médailles fleurons, sculptée en Or. Jean-Baptiste-Claude Odiot (1763-1850) was among the leading goldsmiths of Paris during the Napoleonic era and succeeding decades (see S. Grandjean, ‘L' Orfèvrerie du XIXe siècle en Europe’, Paris, 1962, pp. 80 ff.). Commentary: Matthäus Wallbaum, born in Kiel, became a master goldsmith in Augsburg in about 1590, the year that he married Felicitas Zimmermann, daughter of an Augsburg goldsmith. He married a second time in 1614, and his bride was the widow of an Augsburg goldsmith, Matthias Schreiber. The career of Matthäus Wallbaum and the large output of his workshop was the subject of Regina Löwe's doctoral thesis at Munich University in 1966-7 and of the ensuing monograph published in 1975. The different forms of spelling his name are quoted and discussed in Löwe 1975 (pp. 10-14), including an illustration of his signature on a document preserved in the Staatsarchiv in Augsburg; on the basis of this evidence, it has been decided to continue to use the form used in Rosenberg 1922 and in Seling 1980. As a youth, he learnt his craft in Lübeck in the workshop of Hans I von Tegelen (see J. Warncke, ‘Die Edelschmiedekunst in Lübeck und ihre Meister. Veröffentlichungen zur Geschichte der Freien und Hansestadt Lübeck’ Hrsg. Vom Staatarchiv zu Lübeck, Band 8, Lübeck, 1927, pp. 162 ff., no. 284; for an example of a Lübeck goldsmith's work, see WB.128). His subsequent service as a journeyman in the Augsburg workshops of Isaac Saals and Georg Sigmann did not at first stand him in good stead, because Georg Sigmann was found guilty in 1588 of breaking the rules of the Augsburg guild. Both he and Matthäus Wallbaum had connived secretly to carry out work for Georg Bernhard, a goldsmith at the Bavarian ducal Court in Munich, who was not allowed by the Augsburg guild to make - only to sell - gold and silver items. The execution of Bernhard's lucrative and important commission from Duke Wilhelm, therefore, led to all three, including the young Matthäus Wallbaum, being fined; indeed, as a result of this misdemeanour Wallbaum's service as a journeyman with Sigmann was discounted and he had to serve another two years in order to qualify for consideration. At this date, according to the rules of the Augsburg guild, a journeyman had to have completed a minimum of four years' service in the city, working with at least three different master goldsmiths, before his application could be considered. Wallbaum's fault as a journeyman seems to have been his eagerness for work and his improper acceptance of commissions - passed to him by Augsburg master goldsmiths such as Christoph Behem. Once established as a master and married, Matthäus Wallbaum became one of the more prolific goldsmiths, though it must be stressed that most of his surviving oeuvre - totalling about a hundred pieces - consists of ebony objects such as the numerous devotional house-altars, paxes, reliquaries, monstrances and shrines, all of which are ornately covered in cast silver reliefs and decorative elements. Some of these ecclesiastical items have survived undisturbed in the churches and palace chapels to which they were presented soon after they had been made - for example, the 'Christian IV's altar' of Frederiksborg Slot in Hillerod, Denmark, or Abbot Placidus Hieber's altar at the monastery in Lambach, Upper Austria (see Löwe 1975, nos 3 and 11). Indeed, in the Geistliche Schatzkammer of the Hofburg in Vienna are four of the finest pieces, all of which had entered between 1596 and 1609 into the possession of the Hapsburg Archduke Matthias, who became Emperor in 1612 (see Stefan Krenn, in ‘Weltliche und Geistliche Schatzkammer’, Kunsthistorisches Museum, Vienna, 1987, Room II, nos 58-61). One of the four is very similar to the famous pax of 1606, with the enamelled arms of the Waibel family; this pax has been preserved since that date in the treasury of the Münster at Überlingen (see R. Sänger, Gold- und silberschmiedekunst , Bergkristall- und Steinschneidearbeiten, ‘Die Renaissance im Deutschen Südwesten’, exh. cat., Heidelberg Castle, Badisches Landesmuseum, Karlsruhe, 1986, pp. 670-2, no. L. 100, with col. pl.). However, the grandest of all these devotional pieces is, undoubtedly, the 'Borghese altar', which is 105 cm high. Commissioned by Cardinal Scipione Borghese, nephew of Pope Paul V, it is still to be seen in the Galleria Borghese in Rome, where it was first described in an Inventory of 1619 (see Paola della Pergola, ‘Villa Borghese’, Rome, 1962, p. 77, no. 62, fig. 62). The extant secular items from the workshop of Matthäus Wallbaum are less numerous but, again, many of them are made of ebony and decorated in silver in a similar fashion, though the profane subjects of the reliefs are in marked contrast to those on the reliefs decorating the ecclesiastical and devotional items. 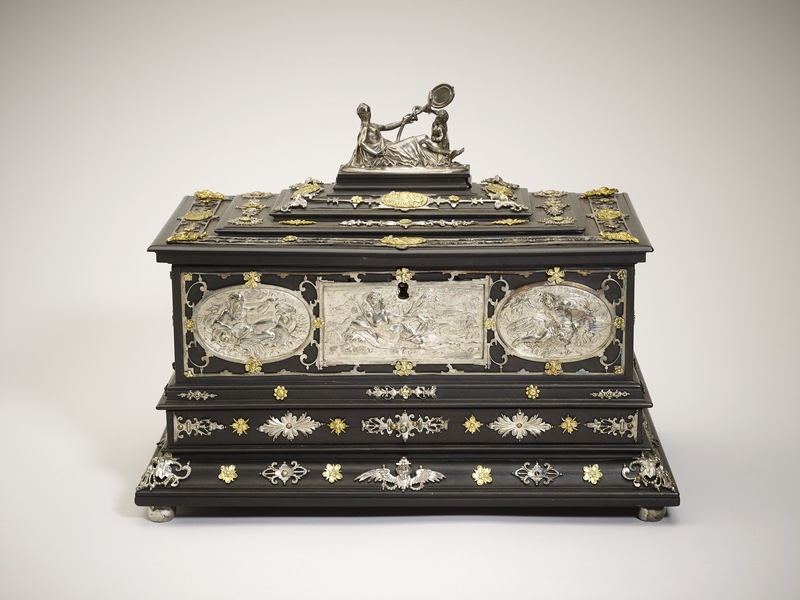 The various ebony caskets, all profusely decorated with Wallbaum's silver reliefs and ornamental openwork, include those designed for holding jewellery, for combs and other toilet utensils, and finally for writing materials. Others of a similar character but different shape were designed to house the mechanisms of clock-automata, like the truly remarkable and well-documented survival from the Imperial Kunstkammer in Prague, which is now in the Kunsthistorisches Museum in Vienna (see ‘Katalog der Sammlung für Plastik and Kunstgewerbe’, II, 1966, no. 373; K. Maurice, ‘Die Deutsche Räderuhren’, Munich, 1976, vol. 2, p. 82, no. 648). All these splendid pieces are dwarfed by the series of magnificent cabinets, both the ‘Schmuckschrank’ (like the documented and beautifully preserved example in the Grünes Gewölbe, Dresden, which was listed in the 1640 Inventory of the Kunstkammer and measures 85.5 x 56 x 42 cm - see U. Arnold in ‘Baroque in Dresden’, Leipzig, 1986, p. 371, no. 511, with illus.) and the ‘Kunstschrank’, which issued from Wallbaum's workshop in response to orders from princely patrons. The most spectacular of these commissions came from Philipp, Duke of Pomerania, whose monumental ‘Kunstschrank’ (a kind of miniature ‘Kunst-und-wunder’ room took seven years (1610-17) to finish. As many as twenty different craftsmen were involved in the many complex and diverse aspects of this tour de force and, though most of the contents of the numerous drawers have survived, Matthäus Wallbaum's brilliant work on the exterior of the cabinet itself (H. 136 cm) was lost when the famous Pommersche Kunstschrank was destroyed in Berlin in 1944 (see Tjark Hausmann, Der Pommersche Kunstschrank, ‘Die Brandenburgisch-Preussische Kunstkammer’, Staatliche Museen Preussischer Kulturebesitz, Berlin, 1981, pp. 65-6, no. 1). Of the few surviving examples of silver sculpture executed in the round by Matthäus Wallbaum, the several different automata versions of the Diana riding the stag group are justly renowned and are discussed in relation to the huntsman automaton (WB.134). However, it is important to note that the example preserved in the Schatzkammer of the Residenz in Munich was not designed to have any mechanical device fitted and, consequently, like the famous Parnassus group on the summit of the (now lost) Pommersche Kunstschrank, it was conceived as a work of sculpture. Apart from the use of coral for the stag's antlers, the entire object is made of silver, richly gilded, and is indeed a work of the highest quality. In Matthäus Wallbaum's oeuvre it is extremely rare to find any type of object entirely made of silver, but one of the best-documented of Wallbaum's works is the solid silver writing casket, preserved in the Schatzkammer of the Residenz in Munich (H. Brunner, ‘Schatzkammer der Residenz München’, 3rd edn of the Catalogue, Munich, 1970, pp. 246-7, nos 586-7; Löwe 1975, pp. 64-6, no. 43, figs 53-4; Seling 1980, p. 258, fig. 249). It was first recorded in the Inventory of the 'Kammergalerie' compiled c. 1635, and it has survived unaltered apart from the two metal hinges on the inside of the lid which ignore, and indeed, disfigure the beautiful strapwork design in relief; significantly, the gilding does not even continue to the edge of the cutting and so is indicative of a change, probably a repair. This solid silver writing casket is almost identical in appearance to the ebony and silver version in the Waddesdon Bequest, having a shallow drawer extending the entire width in the same way. The exterior of the lid has the same construction with appliqué gilded silver openwork ornaments and the same decorative scheme with eight tiny oval plaquettes of the Planets and Signs of the Zodiac, each depicting a classical figure in a chariot drawn by a pair of creatures. On top of the lid, the finial is the same figure group but it is now fixed so that it cannot be moved. At present, the left hand of the reclining female figure is raised but empty; the gesture seems meaningless and makes the composition of the figure group appear highly improbable - or, at least, incomplete. Furthermore, there is a small rectangular hole in the upper left thigh of the reclining figure's leg, which is otherwise covered by drapery. This curious blemish that mars the appearance of the figure appears to relate to the equally strange feature on the Waddesdon example, where the handle of the mirror held in her left hand is extended downwards and terminates in a roughly rectangular 'plinth' embedded in the upper thighs of the female figure. Furthermore, the 1635 Inventory description establishes that this figure originally held a mirror and that the putto's raised hand held a cross; the relevant passage reads: “. . . oben auf ein ligent bildle, so einem Spiegel halt, darbey ein Knäbl mit einem Creizl in der Handt. . .”. Consequently, there seems no longer any reason to doubt the age and authenticity of the Waddesdon version's figure group or, indeed, that very strange square 'plinth' (in the thighs of the reclining figure) supporting the mirror. Whether the mirror itself with its plain back is a replacement or is only repaired at the join with the handle remains uncertain, but undoubtedly there has also been a minor but clumsy repair to the handle of the mirror just below the left hand. The figure group on the Munich writing casket would probably have looked very similar to the Waddesdon group - and both groups would have represented an 'allegory of Prudentia' with the figure of the putto seated on a death's head holding up the cross. The eight reliefs representing the Four Seasons and the Four Elements are exactly the same on the two caskets - indeed, they are arranged in exactly the same order. However, the inside of the lid is quite different, and instead of the rectangular relief of a hunting scene with an attack by lions and a bear there is a smaller relief of oval form depicting Apollo and Flora. Furthermore, the main part of the Munich casket lifts off the base, which contains a silver tray with two long, narrow compartments, one of which is subdivided in the middle, and a further set of three small rectangular compartments, one covered by a hinged lid, one with a sand or pounce-pot, and one with an inkwell which has a lead container and an outer silver case; both have silver-gilt screw-stoppers. The base-plate of this silver casket bears the Augsburg town-mark and the maker's mark struck twice. The four reliefs representing the Elements have been published in Weber 1975 (p. 211, no. 404, pls 112-13) as originating at the “end of the 16th century” in Matthäus Wallbaum's workshop. Only one lead plaquette (Water) out of the set of four is recorded in a public collection; it is in the Bayerisches Nationalmuseum in Munich. However, other identical silver reliefs occur on three toilette caskets (preserved in the Grünes Gewölbe, Dresden, the Historical Museum in Basle and in the Augsburg Museum), on a ‘Kunstschrank’ (in Schloss Köpenick, East Berlin) and on the automaton clock in Vienna. This frequent use of the same silver plaquettes to decorate these ebony objects is a feature of Matthäus Wallbaum's workshop. The four reliefs representing the Seasons have also been published in Weber 1975 (pp. 211-12, no. 405, pl. 113) and even more of Matthäus Wallbaum's extant and well-documented works are listed as being decorated with identical silver reliefs. The set is, again, attributed to “the end of the 16th century” and described as originating in Wallbaum's workshop. The relief of the scene depicting the attack by lions and a bear is part of a set of eight hunting scenes, all published in Weber 1975 (pp. 219-20, no. 416, pls 118-19). In addition to a lead version in the Kunstgewerbe Museum in Cologne, there are silver examples listed on both the Kunstschrank in Schloss Köpenick, East Berlin, and in the Grünes Gewölbe, Dresden, and, again, Dr Weber has attributed this remarkable set of eight plaquettes to Matthäus Wallbaum's workshop at the “end of the 16th century”. The Augsburg workshop of his contemporary Boas Ulrich was also producing similar cabinets, caskets and devotional objects of ebony with silver ornaments; and unless they are marked, it is often difficult to distinguish between them and the more modest creations of the Wallbaum workshop. In London, a typical Boas Ulrich ebony cabinet with its over-ornate fussy appliqué can be seen in the Victoria and Albert Museum (reg. no. M511-1956; see Löwe 1975, p. 104, fig. 108, where it is compared to an unmarked cabinet that was in the collection of Baron Karl von Rothschild in Frankfurt and was published in F. Luthmer, ‘Der Schatz des Freiherrn Karl von Rothschild’, Frankfurt, 1883, pl. XLI). These undistinguished versions from the Augsburg workshops of Wallbaum's followers and imitators serve only to highlight the high standard and artistic quality of Matthäus Wallbaum's own work, especially in his early period at the end of the sixteenth century. Hugh Tait, 'Catalogue of the Waddesdon Bequest in the British Museum. 2, The silver plate', British Museum, London, 1988, no.37, figs.186-199.Note that the hunting scene is shown separately as a plaquette. It was originally fixed inside the lid. This plaquette bears the marks.